Harold S Stephenson East Midlands Divisional HMI was appointed Chief Inspector of Mines (1963-1970) replacing TA Rodgers. James W Calder (1963-1967), succeeded George Miller. The NCB North Eastern Division became Yorkshire Division. Frank Bishop Senior District HMI died on 15th January 1963 aged 48 and was replaced by Freddie W Gill, transferred from Kent. 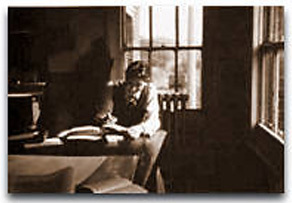 George W Taylor was then transferred to District HMI Kent. Frank Bishop (b 1914) was a Deputy then Safety Officer at Creswell in 1942, appointed to Undermanager. In 1945 he was promoted to Manager at Bestwood and joined the Inspectorate in South Derbyshire and Leicestershire 1947. He was the one who invented the Bishop pack near the gate ends, built forward one bay towards the coal face which diverted the air along the edge of the goaf, not allowing dangerous gases to build up. He was uncle to EE (Teddy) Bishop ex Undermanager Ollerton, Manager Cotes Park and Newstead and later Production Manager South Nottinghamshire Area. Area Safety Engineer at No4 Area, Huthwaite, Nottinghamshire at the time was Frank G Vernon. There was a further outburst of gas at Ireland colliery (Derbyshire) in the Deep Hard seam. 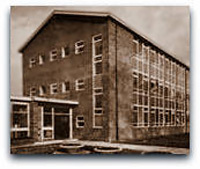 A new modern single-storey office block was erected adjacent to the pithead baths and canteen at Teversal (Nottinghamshire) and were occupied by February 1963. The old Stanton Ironworks Co office block to the right, (see photo above) that had been used since the 1870s was demolished. The photo to the left (taken by Colin Burlinson who lived in the pit yard) shows me as the only person in the large office working that day prior to the move. Also by chance whilst the above photograph was being taken from the dirt tip I was looking through the window marked with the arrow. The Hunt ski-type manrider was installed at Babbington (Nottinghamshire) in 1963, but as mentioned previously the idea did not spread to any of the other local mines. 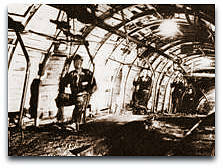 Only a limited number of seats were installed and it was necessary for them to be returned empty to the manriding station before another group of men could be transported so they were very inefficient. At Manton (Nottinghamshire) an AEI Ward Leonard friction winder was installed. At Cadley Hill (South Derbyshire), 2 surface drifts were driven. 2 drifts had been driven previously in 1942, the 3 shafts being sunk in 1860. The (Dr) Beeching Report was issued, stating the reshaping of British Railways. Unfortunately this meant the closure of many stations and branch lines and another loss of coal sales for the area. In fact in the long term it was a disaster. The NCB changed its financial year ending from 31st December to 31st March in 1963. A fifteen month financial period was agreed, to get onto the new system. This had been allowed by the passing of the Coal Industry Act 1962. In March 1963 an agreement was signed that any transferee to the local pits should have his previous earnings protected for 6 to 12 weeks, although I think generally the earnings in Derbyshire, Leicestershire and Nottinghamshire were higher than where they had transferred from in the first place. The Directed Practical Training scheme (DPT) set up to train mining engineers was replaced by the Mining Engineering scheme and also a new Industrial Relations Training scheme came into operation. Water Resources Act 1963 outlined the procedure to be followed when sinking a borehole or shaft or abandoning an old shaft. The River Authority was to be notified as well as the Institute of Geological Sciences. Shirebrook No2 shaft (Derbyshire) began deepening to 808 yards (740m) and steep cross-measures drifts were driven down from the Top Hard also to open up the lower measures. 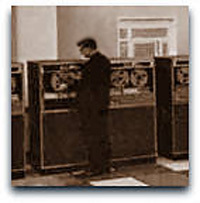 The NCB set up the first computer for wages. 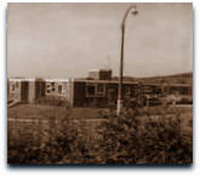 Initially people were set on mainly from clerical grades, such as Cost clerks etc to form a team in 1963, and the old pit offices at Cinderhill, Basford, Nottingham was the base. A computer was installed at Berry Hill, Lichfield Lane, Mansfield, Nottinghamshire in 1964 and the team moved there and initially trials were made to calculate wages for several local pits. 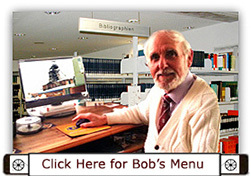 My friend Ralph Simpson (photo) was the first computer operator, who was promoted to Systems Manager. There were double doors to each room as the atmosphere was to be absolutely clean. The system was based on punch cards and mainly women were set on to type in the information. Eventually all the pits in the East Midlands Division were on the system. In 1968 it was decided to move to Doncaster to calculate wages for all pits in the UK. Money in the pay packets was rounded up to round figures, no coppers being given. Any adjustment necessary was paid to the nearest the following week and so on. A further computer at Cannock (Staffordshire) was able to calculate among other things, survey calculations. A pack of coloured sheets had to be filled in with the survey information and sent off using the Area ‘Wells Fargo’ van internal transport system and about 3 days later the results would arrive back at the colliery. This was a great boon to Surveyors at the time, and although quite some time was spent filling in the forms and of course checking the figures, and at that time I personally found it saved many hours of calculating by traditional methods using Logarithms, Shortredes and Natural tables etc and wallowing a hand held Curta calculator and later an electric Facit machine (cast out by the Wages department as they went on to the system outlined above) and received back closed survey calculations based on Bowditch, Least squares and Smirnoff, giving a choice of 3 different values for the survey stations, but of course to the lay man they were the same, being only different in the minute parts after the decimal point, so to speak. This system continued for several years until Hewlett-Packard HP 65 hand-held programmable calculators were purchased for each Colliery Surveyor at £400 each, about the price of a couple of girders, or a few gobbed props, but my, how the Area Surveyor had to go on bended knee to get the orders through the system! These small hand held machines became invaluable and saved hours and hours of work for survey calculations and all other manner of calculations thrust on the table. Anything remotely looking as though a guesstimated figure or a calculation was involved slipped through to the Surveyor like greased lightning! There was a further outburst of gas from the 800 yards (730m) deep Low Main seam at Rufford (Nottinghamshire) bringing the total to four. Again all men were withdrawn due to the dangerous atmosphere. The first rapid loading bunker in the country with merry-go-round trains filled and destined for the Trent side power stations was built at Langwith (Derbyshire) and was operational in 1963. The bunker holding up to 2,000 tons of coal automatically loaded the trucks as the engine moved them slowly beneath the hoppers. 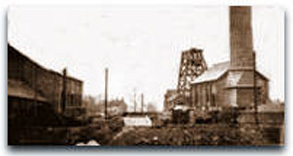 The old dilapidated wooden tandem headgear at Pinxton Sleights Nos 1 and 6 shafts (Derbyshire) was demolished. At Pinxton the No2 shaft steam engine was converted to electric in 1963 using Reynold’s chain drive. A heading was driven in the Low Main at Ormonde (Derbyshire) towards the 1865 abandoned workings of Stoneyford and a borehole was drilled into the old workings proving a water pressure of 120lb/sq in. Stoneyford shaft position- 43/4449/816166. Cecil Bacon was killed on 3s Waterloo face Teversal (Nottinghamshire) as he accidently slipped (possibly caused by moving quickly from a fall of roof or coal) and struck his head on the panzer conveyor. It was discovered he had a paper thin skull. At the TUC conference in 1963 Albert Martin General Secretary of the Nottinghamshire NUM and JT Tighe President attended. 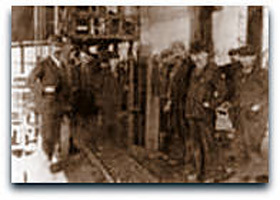 Surface workers were offered a further reduction of 15 minutes per shift with the option of taking 7 rest days instead, however Government policy intervened. 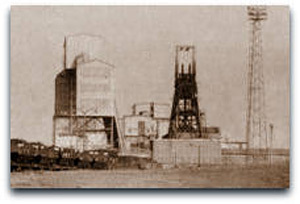 A Rexco carbonisation plant was opened adjacent to Ollerton mine. Other plants were at Thoresby and Mansfield. Another type of carbonisation plant was at Bolsover. A further smokeless fuel called Coventry Homefire was launched. 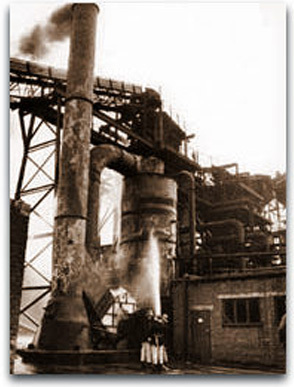 The Coal Products Division took over all other activities such as gas production, blast furnaces etc and the Midland HQ was based at Wingerworth near Chesterfield, Derbyshire. The combined Ollerton and Bevercotes Miners’ Welfare was opened on Whinney Lane at New Ollerton adjacent to the old Welfare and would prove to be very popular and was to host many well-known TV and celebrity ‘turns’ in the future. It was known as the Palladium of the Midlands. The Town and Country Planning (NCB) Regs 1963 came into force on 2nd May 1963.